Looking for tough dog toys? The Super Chewer box is made for pups who deserve a challenge – and for humans who are sick of throwing away destroyed toys five minutes after getting them. Plans start at $29/month and you”ll get 2 toys, 2 treats, and 2 chews delivered to your door each month! PLUS! Click that link and you’ll get 1 month free on any 6 or 12-month plan! My dog Pimm is a tiny tornado of toy destruction. I adopted her 4 years ago thinking that I would have this playful little bean who snuggles all the best BarkBox toys I’d collected for her during my dog-less years of working at BARK, but it turns out Miss Pimm shreds toys faster than any other dog in our entire 400-person office. Because there are many, MANY dogs out there with Pimm’s skills of complete toy annihilation, we created the Super Chewer BarkBox. What is a Super Chewer BarkBox? Super Chewer is a monthly subscription box for dogs who chew. Each month, Super Chewer delivers 2 durable toys, 2 full bags of treats and 2 meaty chews—made in the USA—to your door for you and your pup. -However, with a subscription, you can pay as little as $29/box. -Free Shipping always within the lower 48 states! …And the Vikings of Valhowla! 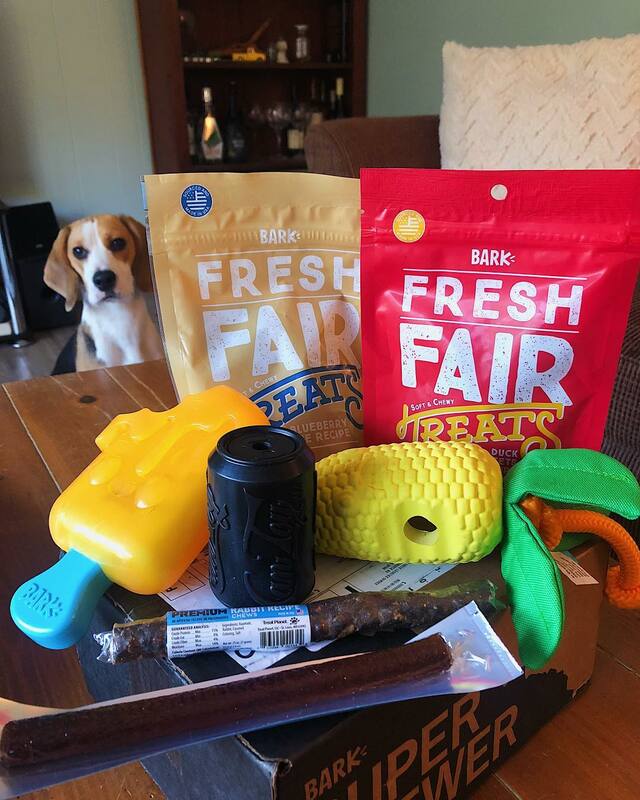 What Can I Expect In Each Super Chewer Delivery? Every Super Chewer toy is designed by our in-house NYC team of dog-crazy industrial designers who obsess over listening to feedback from Super Chewer parents and works to make our toys as fun as possible. We know it’s no fun just tossing your dog a hunk of rubber, so we strive to create toys that also make memories. Katie designing at her desk. We would never give your dog something that our own dogs haven’t given two paws up. For example, my dog Pimm tests many of the toys for our designers. One of my favorite toys Pimm tested from our “Secrets of the Rainfurrest” box is called “Alana the Iguana.” I still have the test version of Alana over 6 months later and Pimm still plays with her! For the toys we send in the Super Chewer boxes, we have a “Fluff-Free Guarantee.” We will *never* send your Super Chewer any toy filled with fluff. We only use the most durable materials like all-natural rubber and ultra-durable nylon. For example, our parrot toy that went out in our pirates Super Chewer box had a plush outer skin and a durable rubber skeleton inside. Two toys in one! Step 1: Subscribe! Subscribe for as low as $29/box. Every box brings your dog more than $45 worth of toys and treats. And if your pup has allergies or any other custom-request, we want to make sure the treats and chews in your pup’s box get along fabulously with their tummies. Any allergies to chicken, beef, or turkey are totally customizable, and if your dog has any other dietary restrictions (or picky-eater preferences!) a quick chat with the BarkBox Happy Team is all it takes to make their dreams come true. Step 2: Your First Box Is Sent Immediately Following boxes ship on the 15th of every month. FREE SHIPPING inside the contiguous 48 United States. Step 3: 100% Satisfaction Guaranteed If a toy isn’t tough enough, we’ll replace it for FREE. Any time, no questions asked. Check out Tornado and his mom playing with the Fling and Feast Treat Catapult toy made out of smoky bacon-scented nylon. But don’t take our word for it, read what some of our customers have to say! The dogs got their first #superchewerbarkbox the other day. I have to say I couldn’t be happier with my decision to subscribe. I paid for one dogs subscription and the two dogs share. One month’s box comes with two bags of dog treats, 2 toys and 2 chews for less than $40 a month and free shipping. It seems like an additional expense but really any time I go to Petsmart I spend way more on flimsy toys. At first, we didn’t know how the dogs would respond to the tough chew toys for Super Chewers but they LOVE them. I just had to share because if you love your fur children like we do – I HIGHLY recommend looking into Bark Box or Super Chewers. The treats are all natural ingredients and made in the USA. I feel like this seems like an advertisement but really I’m just one very satisfied customer. The box is themed and absolutely adorable. If you have kids they have little puzzles and games to play “with your kids and dogs”. We obviously don’t have kids but – we are big kids ourselves 藍–Shannon R.
His toys are holding up to his excessive and brutal chewing like most toys are not able to. He finally has plenty of toys to consistently stay occupied (rather than turn to my shoes). –Shannon O. My wife and I had stopped purchasing toys for Samwise because he had a bunch and we didn’t want to keep paying $15-$25 a piece for good quality toys that he would destroy in seconds. We were already paying $8-$15 for nice treats. Now we are getting better quality treats and toys for a fair price. Everyone is happy! –Brian K.
After all that, do you want to give Super Chewer a go? Each month, get two original toys, designed in-house, two full bags of all-natural treats, two savory chews, and a whole lotta fun. Click this link and you’ll get 1 month free on any 6 or 12-month plan!